It's been a while since I wrote a post for Compassion, but this one was just too good to pass up! Kids love birthdays, don't they? They love the parties and the presents and the cake. They love the attention and the excitement. Last year Nathan did a countdown for his birthday, and everyone in his class knew how many more days until Nathan would turn 7. 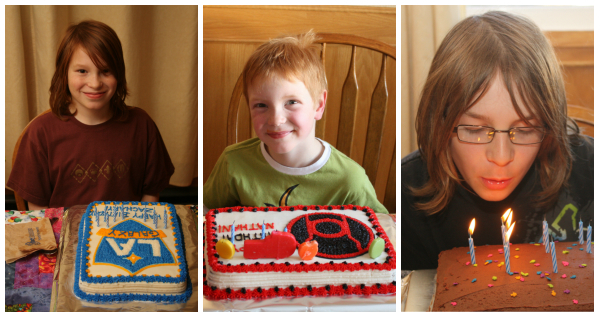 Zachary, Nathan and Aiden on the 2015 birthdays. Boy do Zach and Aiden look different now! My birthday is in the summer, so we were often on vacation on my birthday. There was one year we were heading home, so we left Ontario, drove through Quebec and into New Brunswick, where we stopped for the night. My Dad joked that it's not every kid who gets to see three provinces on their birthday! I even spent one birthday here in Newfoundland, though I lived in Nova Scotia growing up. We stayed at campsite number 12 in Terra Nova National Park, which I remember because we arrived at the campground the day before my 13th birthday, so I spent one night being 12 at campsite 12. "As one of the world’s leading child development organizations, Compassion partners with the local church in 26 countries to end poverty in the lives of children and their families. Today, more than 1.6 million children are discovering lives full of promise and purpose as they develop in all the different aspects of their lives—their minds, bodies and relationships while discovering God’s love for them in the gospel of Jesus Christ." If you're interested in sponsoring a child through Compassion, they now have a page that features birthday boys and girls who are waiting for sponsors. Wouldn't it be a great birthday memory for a child to be sponsored on their birthday? Visit this page to see who is celebrating a birthday today. Sponsoring the birthday boy or girl would change their lives forever!